As I write this piece sitting in Singapore on 27 Jul 2015, the TV breaks the news of a terrorist attack along the Indo –Pakistani border in Gurdaspur in Indian Punjab.Three to four terrorists in Army uniform have carried out multiple attacks on a police station, a state transport bus and the Gurdaspur- Pathankot railway line. They had earlier commandeered a Maruti car and drove in it to the targets, there after barricading themselves inside the police station. There are casualties and the attack smacks of the 26-29 Nov 2008 Lashkar – e- Toiba attack on Mumbai , but on a smaller scale and of course with different targeting. It remains to be seen as to how the Modi government reacts. Going on seven decades post its independence from British shackles, India has been criticized the world over for its generally pacifist mindset and world view out of sync with its huge size and emerging economic power status. This erstwhile land of “ milk n’ honey”( in the era before the British yoke plundered most of its material wealth), found itself adopting a reactionary approach to national security and war , the very first challenge coming in 1948 in Jammu & Kashmir. The strategic brains of the supposedly astute Kautilya’s successors have shown themselves to be essentially defensive in nature - a Hindu view of life perhaps- opting in all its wars so far to hit back only after it had been hit first.When the Pakistani Razakars overran Kashmir India's just-about timely reposte managed to save two thirds of Jammu &Kashmir from the Pakistani marauders. Come 1962 the Chinese intruded into Ladakh with disastrous consequences for India's national pride and sovereignty.The story was similar in 1965 when Pakistani troops overran the Rann of Kutch and India’s reactionary efforts only brought about a stalemate.Even in 1971 , with a clear military supremacy followed by a massive surrender of Pakistan's Eastern Army, India waited for its adversary to carry out a preemptive strike on its airfields in the West before reacting. The happy outcome of the war for India was mainly on account of the decimation of enemy forces in the East and not so much due to any kudos it achieved in the Western sector.And of course all the bonus of a huge 93000 POW bank was frittered away by Madame Gandhi at Shimla! This reactionary military policy has never stood India in good stead.However times appear to be changing now. India's new found confidence , brimming from its existing economic and human resource clout has led to a sea change in the country's world view and the aspirations of its 60 % of people younger than 35 years of age. The recent military preemption by the Indian Army and Air Force against Indian militant outfits camped across the border in Myanmar needs to be seen in this backdrop and though it created quite a furore in diplomatic circles, the event marked a significant turn around in India's politico- military posture. Though the the Modi government initially attempted to show this mainly as a significant change in national military strategy, the fact remains that India has had such capabilities for eons now, though the intent for strong counter terror action had been found wanting. Yes the government perhaps could take credit for a timely decision, but like in all such” special operations” credit should go to the military and its combat elements.Special operations are naturally conditioned by elements such as surprise, intelligence and weather , training and audacity also being important ingredients . Cases in point such as the Osama raid by the U.S. In Abbotabad on 2 May 2011 or the Entebbe raid by Israel on 4 July 1976 indicate the out-of-proportion impact of Special Operations. These operations are done by most militaries come war, but very few establishments have the temerity to undertake them during peace time or as part of "Operations Other Than War" (OOTW) or indeed during proclaimed no-war situations. A country’s international standing is a big factor in such recourses, viz countries such as the U.S. or Israel. India now finds itself established as a “responsible” democratic entity in the comity of nations , known for its worldwide international and U N commitments besides being a proven secular multi ethnic polity. Strong leadership as perhaps evident presently gives India the political option for preemption,a much needed option especially against terror- sponsoring nation states or non-state actors. The danger in a preemptive strategy, for India as the dominant power in the region , is to be seen as a "regional hegemon" , impacting on its prolonged efforts at regional peace and cooperation, such as the SAARC. Where possible therefore India must take the host government into confidence, as was ostensibly done in the Myanmar instance. But in other cases, such as the state-sponsored terrorism from Pakistan ,the modus operandi has to be much more nuanced , timely and appropriate.Terror acts, especially when funded and orchestrated from outside the target country need to be countered with a slew of measures, both in terms of soft kill and hard kill options, else the innocent target country, invariably the one with a more democratic outlook, finds itself in the zone of diminishing returns in countering terrorist acts. Post 9/11 there has been a change in focus by most countries as far as war priorities are concerned. Conventional large scale wars have almost become passé , with some exceptions such as the ongoing Russian misadventure in Ukraine. Most nations including the U.S &U K have reoriented their war strategies around Counter Terrorism. Traditional “ bad boys” such as North Korea and Iran have been eclipsed , in terms of world attention , to terrorist entities such as Al Qaeda and ISIS.Even in the subcontinent, an all out war between India and Pakistan has become increasingly unlikely, given the nuclear overhang. Border skirmishes and counter terror operations would increasingly assume centre stage . We shall first look at the terror threat spectrum starting with India’s smaller neighbors , before considering the case of its “enfante terrible” , Pakistan . These are the neighbors that , comparatively , do not have any substantial offensive military capabilities , nor do they harbor aggressive politico- military designs against India. Bhutan is land locked and virtually a protectorate of India vide existing security protocols. Thus no terrorist havens obtain there and not are they likely to materialize in the foreseeable future. India has organizations in place such as the Indian Military Training Team (IMTRAT) which could easily be adapted for conduct of special ops should the need arise .Maldives once again does not pose any terrorist threat , though some LTTE -sponsored terrorist elements did seek to take over that country in 1988 and the government there sought India’s help in neutralizing them, which was successfully done during “ Op CACTUS “ . Nepal on the other hand is a Hindu nation and the considerable goodwill its citizens have for India has been bolstered by India’s unflinching assistance rendered during the recent earth quake calamity there. Nevertheless there are chances of undesirable terror groups seeking havens there, possibly with Chinese collusion .Given the historically excellent ties India enjoys with Nepal India should be able to convince That country to undertake its own counter terror ops , if need be with Indian collaboration . Indian air power capabilities along with the fighting spirit of the Gurkha would be a force to reckon with for any probable terrorist havens there. With Bangladesh relations have come a long way under the ruling Sheikh Hasina regime compared to what they were a few years ago under the Khaleda Zia regime.The hardliners in Bangladesh (BD) Army / Directorate General Forces Intelligence (DGFI) are expected to have been substantially marginalized by now.Operational cooperation between The Border Security Force of India and BD Rifles has considerably improved. But BD does have some air power capabilities (including a few MiG 29s) and some Naval holdings. A sizable Army too exists , whose leadership fortunately is no more anti – India, having been trained in India rather than the earlier lot trained in Pakistan .For any trans – border operations against terrorist elements of the HUJI group or Indian underground groups in the Chakma Hill Tracts or similar regions close liaison with BD military, BD Rifles and of course civil leadership India's special forces experience during the BD liberation war in support of the Mukti Bahini would come in handy of course. This again is a neighbor where India has had military experience in. The hard lessons learnt during Op Pawan 11-25 Oct 1987 where India went in to neutralize the LTTE( having earlier trained them covertly! )would help it to undertake any counter terror operation there in future. Sri Lankan armed forces have once again had Indian training( besides from Pakistan )and this would help in collaborating with them. Whilst no immediate terror threat exists across the border and Line of Actual Control with China, India could well envisage future border skirmishes against that country . Air power would play a big role here, especially by way of employment of transport aircraft and helicopters in switching forces along multiple axes. The IAF is decidedly more capable along the Indo- China border and in any future scenario triggered by water dispute or boundary issues , India would be well advised to employ air power optimally, much as it refused to do during the 1962 Chinese debacle. India’s biggest bugbear in terrorism has of course been Pakistan.. Unfounded alarmist fears by many an analyst about the nuclear threshold being a demotivator for any future Indo-Pak conventional confrontation have been amply disproved during the Kargil Conflict. Indeed this sector , along the International Border and the Line of Control would pose the biggest challenge for Indian security planners seeking to adopt preemption as a politico- military strategy. Essentially what India needs for preemption are military forces( special forces troops and aircraft both fixed wing & helicopters/ / UAVs), a strong intelligence capability ( both HUMINT & TECHINT)and sensors to enable safety of the strike elements during ingress and egress( such as AWACS/AEW and adequate Suppression of Enemy Air Defences (SEAD), by way of hard kill and soft kill options. The former would include attack heptrs and fighters and the latter Electronic Warfare elements, AEW, UAVs, besides suitable close in and stand off weaponry suited to the operational scenario. Most of these India already possesses , except perhaps numbers of Special Forces which are vital to hold territory and neutralize the opposition and the targets. Pending acquisitions such as Apache AH-64 helicopters and Boeing Chinook CH 47 troop carrier helicopters need expedition. Presently India has nine battalions of Para Commando Special Forces with its Army. This needs to be beefed up adequately( at least doubled in numbers . Indian Army has another 7200 commando troops attached to its 359 infantry battalions which could be reorganized ) to cater for preemption options on all sectors without and within the country. In this context a big handicap has been the lack of an Integrated Defence Force as most leading militaries have. India has allowed inter -service rivalries and turf wars to impact its capabilities. What is needed is a truly tri-service approach and an effective pooling of resources. So too for the Special Forces capability: Indian Navy’s Maritime Commandos (MARCOS), Border Security Force (BSF)'s Commandos, the National Security Guards - around 15000 well equipped troops meant mainly for VIP security, and the various state Police commando battalions all need to be integrated to meet the terror threat optimally depending on the location, terrain and potency of enemy forces. Currently there has been talk of setting up a Special Operations Command a la the U S SOCOM. Protagonists argue that this would perhaps force the Government to provide adequate funding for the Special Forces, which is not the case now. Command and Control being vital for any such operation adequate coordination between the ministries of Home , Defence and External Affairs would be a must. Besides the force structure India direly needs to adapt its military strategy to one of preemption. Traditionally the subcontinent has had a war history dominated by India and Pakistan fighting over Kashmir. Not having reconciled to a bigger and secular India post partition in 1947 and then again the rankling it faced over losing its Eastern wing in 1971, Pakistan’s attempt has been to destroy India “ through a thousand cuts”. Kashmir was a convenient excuse to build this animosity around. But 9/11 changed things dramatically. American and NATO campaigns in Afghanistan called Pakistan’s bluff as a state sponsor of terror. It finds itself , virtually, in a two – front situation with a hot border along the Durand line with Afghanistan and its traditional for India to the East. The world has tired of Pakistan’s antics on Kashmir , it's nuclear proliferation and its lack of a democratic polity. With the NATO withdrawal from Afghanistan Pakistan will attempt to refocus its India policy around its “ strategic assets”, viz home grown terror groups. Whilst some token military effort would go towards countering elements such as the TTP, it's Army’s survival would depend on a hot border with India.Recent reports of extra constitutional human rights violations by the Pak Army on TTP suspects would do little to dissuade its Army from highhandedness, given its vast corporate interests in the country. India will need to re-balance its armed forces around the new world threat phenomena such as terrorism, sea piracy and actions of a few “rogue” states. Essentially this would mean “ a lean and mean” armed forces. This would involve having mainly precision hard kill capabilities and back up conventional military wherewithal such as armor/ artillery/ infantry and air power sea power assets for a deterrent conventional conflict. Army's 49% of Defence budget share at 99000 crore rupees and its around 30% of the Defence Capital budget would have to be re-prioritised so as to give more funds for Special Forces modernization. Pending big ticket accruals such as the 24 AH-64 Apache gunships and 15 Chinook CH-47 F troop carriers worth 2.6 billion $ would need to be expedited. Nuclear capabilities would need to be maintained at optimum levels to counter Pak/ China nuclear postures.Optimizing the force structure is just one part of the re-balancing of forces, the more important follow – ons such as supporting doctrines and related training being equally vital. Taking a leaf out of the CIA experience in its Drone Wars in Afghanistan & Yemen India needs to consider rendering its external intelligence agency R&AW with a hard kill capability comprising UAVs and Special Forces. Presently hard kill UAVs are only available with the Americans , not even with the Israelis.UK too has American Reaper drones but no hard kill capability with Hell Fire missiles. An important element in a preemptive scenario is deniability. The government should be able to keep the operations entirely secretive , with a suitable decision matrix including the executive political authority, in India’s case it's Prime Minster. Of course the Parliament needs to empower the PM with such authority( somewhat akin to the Nuclear Launch Command authorization)hard kill UAVs would come India’s way sooner than later, with Attack heptrs or ground attack fighters substituting until then.if such capabilities exist with the country's intelligence agencies the much touted international norm of “ deniability” could be achieved. Depending on the setting the military preemptive package could be configured differently. A single service force , a bi service one or a tri-service mission could be envisaged.The exact numbers and constitution would of course depend on the threat scenario and opposition expected, a “hot zone “demanding elements for suppressing air defences, electronic warfare, AEW, fighter cover,Combat Search & Rescue, special forces and the like. A sea ward operation on the other hand may perhaps only call for the Indian Naval assets to be deployed. Likewise there could be scenarios for only doing a preemptive air strike.special forces insertion and extraction would need air power support such as Heliborne Forces and even C 130J type of integration.Casualty evacuation missions could also be envisaged , a la “ BLACK HAWK DOWN”. Surprise and total surprise at that , being vital training including realistic scenario training is inescapable. The elaborate work up done for raids such as the Entebbe and Osirak nuclear raid by the Israelis need to be factored in. It is widely established that a big contributor to India’s Kargil victory was its powerful media strategy. Embedded journalists ( perhaps employed for the first time in this manner)along with daily tri-service briefings organized by the Ministry of External affairs virtually put paid to Pakistan’s claims of the intruders being non- state actors rather than the Northern Light Infantry troops that their IDs indicated. For preemption to carry home its advantages the media has to be carefully orchestrated. India was traditionally accused of not having any worthwhile military strategy as a nation . Nevertheless it then went through five decades of creating a balanced armed forces designed to fighting a conventional campaign against Pakistan and China. Then came the era of asymmetric warfare involving militant organizations fighting in cities and in other terrains against regular troops of USA and its allies.be it lone wolf operations or coordinated attacks such as the Mumbai carnage by the Lashkar –e- Toiba the civilized world has become increasingly vulnerable to terrorist forces. Western nations have sought to fight terror via the NATO medium. For India the change in threat spectrum has been gradually evolving but surely so. With China involved in military modernization whilst consolidating its economy, its close ally Pakistan has been tumbling down the abyss of an uncertain political future as a viable democratic nation, India's threat would increasingly revolve around terrorism- centric attacks on innocent populace. This coupled with indigenous disgruntled elements such as Maoists and the militant groups of the North East , there is a clear need for India to rehash its politico – military strategy , if it is to be able to provide security to its citizens. Accretion of military capabilities by militant groups would call for reorientation of size able elements of standing armed forces into highly mobile, technologically advanced precision stoke forces. This would involve force structure changes and reads oration of doctrines and training. The nature of threat posed by militant organizations would increasingly call for preemption as an option. This has to be dovetailed with astute leadership, strong media support and intelligence sensitive attack options. In India's case this would pose peculiar challenges , given the lack of integrated military organization , paucity of Special Forces and hitherto lack of political will. The recent cross border raid carried out by the Indian military against indigenous terror groups havens in Myanmar augurs well for the country to dramatically overhaul its military responses to state-sponsored , indigenous and other terror threats over land and sea. Preemption is not necessarily a bully's choice but a contemporary strategy available to democratic, secular, stable polities such as India. That would be the way forward for correct political signaling to ill- meaning adversaries and entities. India has suffered enough from terror and the tolerance limit is well past. 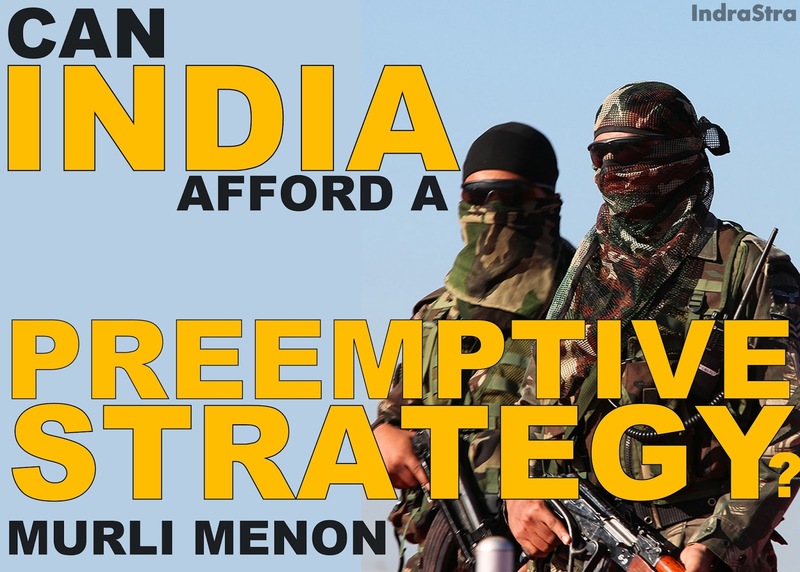 A strategy of preemption would give the country the option to selectively target terrorist hide outs and training camps across borders, incrementally ratcheting up the pain inflicted on the adversary , making it un-affordable for him to use terror as a convenient tool in nefarious statecraft.it is high time India re-balanced its military to give it more special forces capabilities and a viable preemptive military option against states and groups sponsoring terror across the borders into India. Elite Commando Units of India: MARCOS, COBRA, NSG & more.